The earliest groups of Volga German immigrants arrived in the United States in 1875 settling primarily in Rush and Barton counties in Kansas and Franklin, Clay and Hitchcock counties in Nebraska. 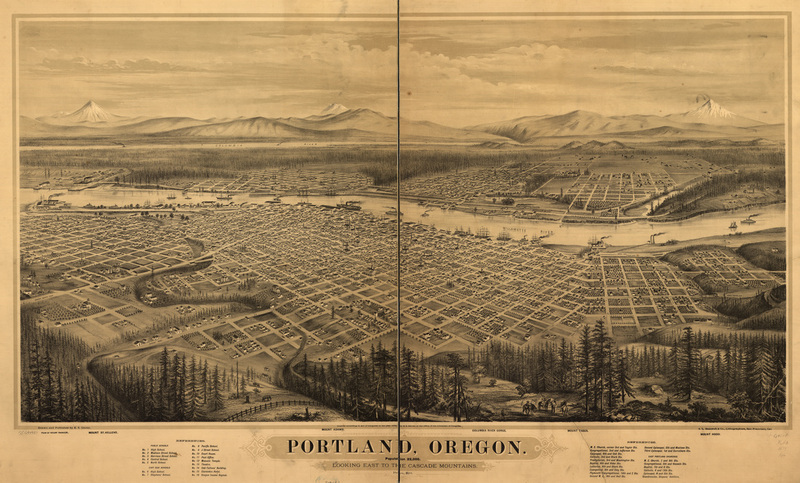 Birds eye view of Portland in 1879, two years before the arrival of the first Volga Germans. Albina is shown at the far left of the map on the east side of the river. Library of Congress Catalog Number 75694937. The Kansas group included the Rothe, Grün, Ochs, Litzenberg, Batt and Weitz families who had arrived together in New York on December 30, 1875 aboard the steamship Montreal. These families were from the Volga German colonies of Frank, Brunnental and Rosenfeld (both daughter colonies of Norka), and, Neu-Yagodnaya Polyana, Schönfeld and Schöntal (all three were daughter colonies of Yagodnaya Polyana). After several years of crop failures, drought, tornados and severe electrical storms which they had not experienced in Russia, some members of the Kansas colony looked for better opportunities in the Pacific Northwest. The Nebraska settlers also suffered from drought and locusts and they endured three years of wheat crop failure. Their cattle were starving from lack of food and water on the range. Members of this group wrote about the heavy and enduring winds that were "unendurable" and the terrible conditions living in dugouts or sod houses. If that weren't enough, the Nebraska group found that their settlement was located near the Great Western Cattle Trail which was used to move long drives of cattle from Texas to northeastern markets. During the drives, fields and gardens of the Volga German settlers were overrun by the cattle. Some members of this group had considered moving to the Pacific Northwest as early as 1880. The group in Culbertson, Nebraska wrote to Oregon Railway and Navigation Company (OR&NC) in San Francisco expressing their interest in moving 160 families to the "Washington Territory." Their letter was forwarded to Henry Villard who owned the OR&NC at the time. 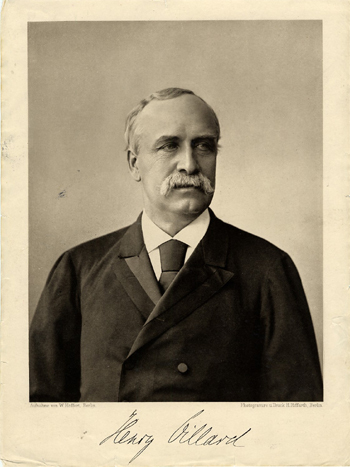 Henry Villard, a German immigrant to the United States, was a pivotal figure in the growth and development of the Pacific Northwest and the settlement of Volga Germans in the region. Villard was designated as "Oregon Commissioner of Immigration" in November of 1874 and set up offices in Boston, Omaha and Topeka that worked in cooperation with the Northwest Immigration Bureau in Portland. Villard established the Oregon Improvement Company (OIC). Villard promoted Thomas R. Tannatt, a former advisor to President Abraham Lincoln, to serve as general agent of the OIC and notable Portlanders C.H. Lewis, Henry Failing, C.J. Smith, J.N. Dolph and C.H. Prescott were appointed as directors. In October 1880, the OIC purchased 150,000 acres in the heart of the Palouse country of Washington. Two of Villard's transportation companies, the OR&NC and the Northern Pacific Railroad, were principally responsible for the migration of the first Volga German settlers in the Pacific Northwest. Men returning from railway survey work in the Pacific Northwest spoke to the settlers in the Midwest about the beautiful country and fertile land they had seen. Transportation companies such as the Union Pacific, Northern Pacific and the OR&NC soon provided favorable advertisements in German language newspapers of the lush regions of the "Great Columbia Plain" and formed associations to offer reduced rates for those who wished to travel westward during the winter months. These companies hoped to profit from providing passenger services, tapping the immigrants as a labor source for the construction of their railroads and as a market to sell their acreage. As the Oregon country developed, the railroads would also benefit from the movement of people and commodities. Freed from their five-year commitment under the Homestead Act, and tempted with the promise of good farmland and jobs, many in Kansas and Nebraska looked favorably to the Pacific Northwest. A group from the Kansas colony was the first to depart from the Midwest in 1881. The families of Georg Heinrich Grün (George H. Green), Peter Ochs, Philipp Hergert, Adam Hergert and Heinrich Scheuerman were among this group. The group traveled on the Union Pacific Railroad to San Francisco. From San Francisco they sailed north aboard Villard's Oregon Steamship Company crossing the treacherous Columbia River bar and continuing upriver to the confluence with the Willamette River and their final destination at the docks located east of Portland in the townsite of Albina. The first Volga Germans to arrive in Portland from San Francisco possibly sailed on the "Steamer Oregon" (or a similar vessel) which was owned by the Oregon Railway and Navigation Company in 1881. 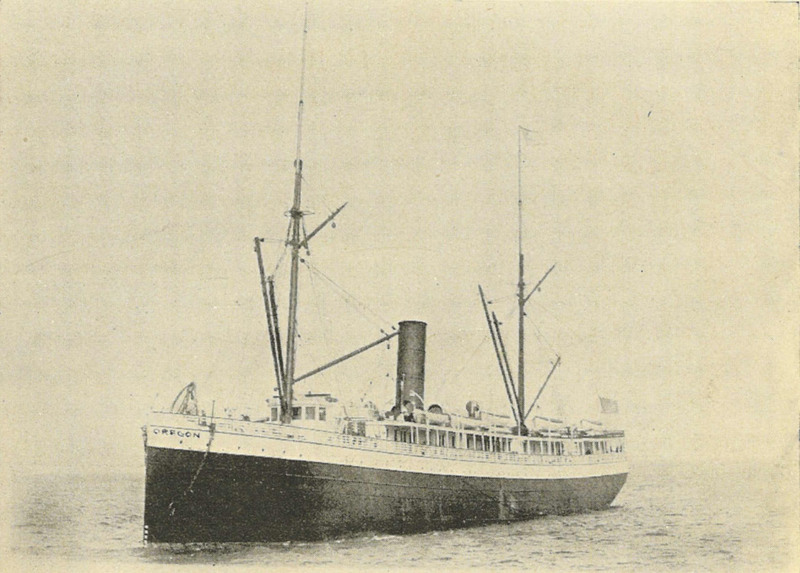 Source: Photo of the "Steamer Oregon" in 1900 from a brochure titled "Seattle and the Orient" edited and compiled by Alfred D. Bowen. The photo is uncredited and in the public domain. In late 1881, the Kansas contingent became the first Volga Germans to arrive in Portland. The group immediately settled in Lower Albina near the Willamette River, probably on lots that were platted in 1873 west of River Road. ​At that time, the City of Albina had not consolidated with the City of Portland. Some people, such as the Peter Ochs family, lived in houseboats. The Hergert, Kleweno, Ochs and Scheuerman families temporarily boarded at that Oriental Hotel. ​The men went to work on the construction of the Albina fill project for the OR&NC which began in March 1882. Others worked at a local lumber mill (probably the Albina Steam Saw Mill). The Albina waterfront was undergoing rapid industrial development at this time. The OR&NC opened a gigantic 900 foot ocean shipping dock in 1882. In 1883, William S. Ladd incorporated the Portland Flouring Mills. The seven story mill was located near the rail yards and docks and became the largest in the Northwest. Despite the abundance of work opportunities, the original intent of the Kansas group was to find prime farmland. However, they soon discovered that the heavily forested areas around Portland were unsuitable for this purpose. They were directed by officials of the Portland office of the OIC to consider settlement on land in the Palouse country of Eastern Washington which the OIC had recently purchased. Two scouts from the group, Phillip Green (the son of George H. Green) and Peter Ochs (both conversant in English), were selected to view the area near the present day town of Endicott. Thomas Tannatt hoped to sell them an entire township. Green and Ochs secured passes on the Union Pacific Railroad and traveled to Almota on the Snake River. From there, they went north to Colfax and on to the present site of Endicott which was undeveloped grassland at the time. Green and Ochs observed that the land in this area was fertile and would make a very suitable home. They quickly returned to Portland in late summer to organize their families and friends for the move to the Palouse Country. On a beautiful day in late September, a group including members of the Green, Ochs, Litzenberger and Batt families departed from Albina aboard mule drawn covered wagons. The weather on the Emigrant Road turned wet, snowy and cold as they traveled to Walla Walla. On October 12, 1882 the party arrived at the settlement site and pitched their tents. Others members of the party departed from Albina a few weeks later, traveling by rail to to the terminus at Texas Ferry (now Ripiria, Washington) on the Snake River. This party was met by the group that had arrived earlier and by OIC teams who transported the new arrivals and their belongings to the settlement area. Some of the settlers lived in dugouts during the long cold winter months. Some said it rained inside as well as outside - only a little longer inside. The Kansas group would soon cross paths with the second group of Volga German emigrants who had arrived in Eastern Washington from Nebraska in 1882. A few households that were part of the Kansas group, including Philipp Hergert, Adam Hergert and Heinrich Scheuermann found land west of Portland near Cornelius. They settled with other German immigrants and established the community of Blooming, Oregon where they founded St. Peter's Lutheran Church. It isn't clear how many people in the Kansas group, if any, remained in Portland. George H. Green, moved to Silverton, Oregon where he purchased 100 acres. George established a store on his property and initially named it Green’s Station, later changing the name to Switzerland. Although the Nebraska colony had received a favorable response from the railroad officials in 1880, they delayed their decision to migrate to the Northwest until 1882. In March, a caravan of 40 covered wagons, 28 of which belonged to Volga German families, began traveling west on the Oregon Trail along the Platte River. There were 16 Volga German families from the colonies of Frank, Kolb, Messer, Norka and Walter in the party, which also included families of English origin. The Volga German families known to have been part of this group include: Amen, Bastron, Bauer, Dewald, Kanzler, Kembel, Kiehn, Michel, Miller, Oestreich, Rosenoff, Schäfer, Schoessler, Theil, Wagner, Wolsborn. The Thiel family alone had 4 wagons. Also traveling with the group was the Reverend F. Frucht. Johann Frederich Rosenoff from the Volga German colony of Kolb was chosen as the leader of the group. Johann Heinrich Oestreich and Georg Heinrich Kanzler were selected to serve as scouts. The group never traveled on Sundays, choosing to draw their wagons in a circle with lookouts posted as an elder read the church services in German. The Reverend Heinrich Franz Michel served as minister to the party. ​Upon arrival in North Platte, the party hired Union Pacific Railroad flatcars to transport them across the Rocky Mountains. All of the wagons, animals, supplies and people were loaded onto the railcars which traveled to the end of the line at the Ogden, Utah station. The functional two-story wooden frame station was built in 1869 on a mud flat along the banks of the Weber River. In Ogden, the men worked to earn money for the next stage of their journey to Walla Walla, Washington. Ogden, Utah in 1874. Source: National Archives of the United States. The image is in the public domain. By May 20, 1882, the pioneers departed from Ogden and traveled on the California Trail to its junction with the Oregon Trail near the Snake River headwaters. In American Falls, Idaho the men were given temporary work constructing a new section of rail that would eventually pass through Boise, Idaho and Baker City, Oregon to Pendleton, Oregon. In each of these frontier towns, work was found to earn money that was used to replenish supplies. When the party arrived in Pendleton, Oregon, most of the members decided to go on to Walla Walla, Washington where they arrived late summer and spent the winter months. While in Walla Walla, the families met Ritzville founder Phillip Ritz, who encouraged them to consider his settlement. At the time the town consisted of a railroad depot, a storage shed, and about 60 people. Some of the pioneers chose to stay in Walla Walla while others moved to Ritzville in the spring of 1883. Here they found jobs and purchased homesteads. 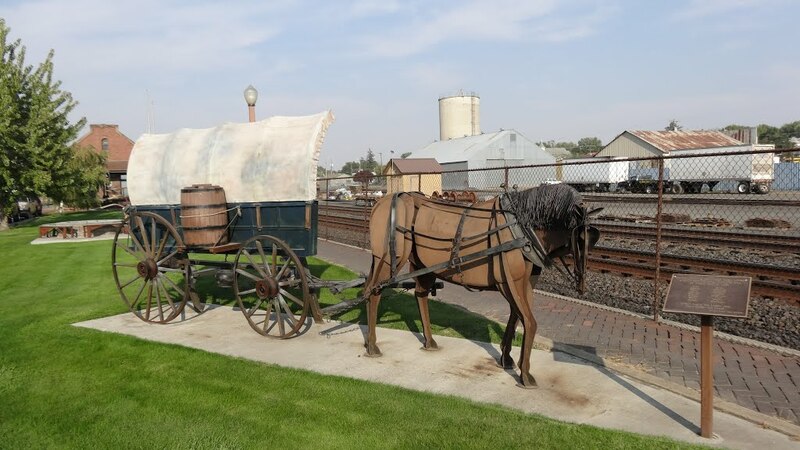 A metal wagon trail sculpture in Ritzville commemorates this groups pioneering journey. Wagon Train sculpture in Ritzville designed and constructed by Lamar Thiel, a descendant of one of the pioneer families. ​The Volga German immigrants found Adams County's semi-arid climate and ecology well-suited to raising wheat, which many had cultivated in Russia. Like other settlers there intent on planting crops, the Rosenoff party began digging up and burning sagebrush by hand. The families settled on the western and northwestern edges of town. When the Nebraska caravan arrived in Pendleton in the summer of 1882, a small number of families made the decision to travel further west to Portland. This party probably continued their journey by covered wagon. Villard's Northern Pacific Railroad did not complete its transcontinental line terminating in Albina, until September 11, 1883. The last section of the line used the OR&NC system on the south side of the Columbia River from Wallula Junction. Upon arrival in Albina, the members of the Nebraska party joined the remaining families from Kansas that had arrived the prior year. "There was a large group in the early days. Some people lived down on the Willamette River in houseboats. Flooding wiped them out and they moved to the Albina area along Union Avenue. Mr. Geist said he would live anywhere but San Francisco." Mr. Geist was likely referring to the great flood of 1894 which devastated the Portland area and Willamette Valley. With the completion of the transcontinental railroads, other Volga German pioneers followed the first two settlement groups to Portland. Some relocated from the Midwest and some traveled directly from Russia to reunite with family and friends. ​A trickle of Volga German pioneer families continued to arrive in the Albina settlement from 1883 to 1889. A much larger group came to Portland between 1890 and 1895, many of these people were from the colony of Norka. Rand, McNally & Co. map showing the Northern Pacific Railroad, Union Pacific Railroad and the Oregon Railway and Navigation Company rail and ocean transportation routes in 1882. Source: Library of Congress Geography and Map Division Washington, D.C. 20540-4650 USA. Catalog number: 98688748. There were many factors that influenced the first Volga Germans to settle in Albina. At the time, Albina was essentially a company town, the company being the Oregon Railroad and Navigation Company which owned the extensive Albina railroad yards car shops and docks along the east side of the Willamette River where the Kansas group likely disembarked after their voyage from San Francisco in 1881. The Northern Pacific Railroad, which was completed two years after the first Volga Germans arrived, terminated in Albina. At the time, access to Portland on the west side of the river was by ferry only. Much of the productive farmland in the Portland area had already been claimed in prior decades leaving the Volga Germans to seek work in the city. Land in the newly developing Albina area (which did not become a city until 1887) was relatively inexpensive to purchase and it was very close to the railway works were many early immigrants found employment. Given that Albina was a very lightly populated area in the early 1880's (143 people in 1880), it was possible for many people to build homes and live together as they had in Russia. Living in close proximity allowed the Volga Germans to maintain their language, culture and identity in a new land. The establishment of churches and businesses to serve the community was also made easier given the compact nature of the settlement. This group of pioneers in Portland would grow to over 500 families by 1920. Galbraith, Jean and Schwisow, Joan. Obituaries of the Volga Germans on the 1882 Wagon Train. May 1998. Kelley, Barbara Camp. "Information about Phillip Green and Anna Rothe." Telephone interview. Aug. 2016. Barbara Camp Kelley (Milwaukie, Oregon) is the Great-granddaughter of Phillip Green and Anna Rothe. Killen, John. "Past Tense Oregon: Vintage 1894 photos show floods nothing new to Portland." OregonLive, 09 Feb. 2015. Klaus, Lois. "The Wagon Train". AHSGR Oregon Chapter Newsletter. Vol. 20. No. 6. November/December 1999. Rath, George. 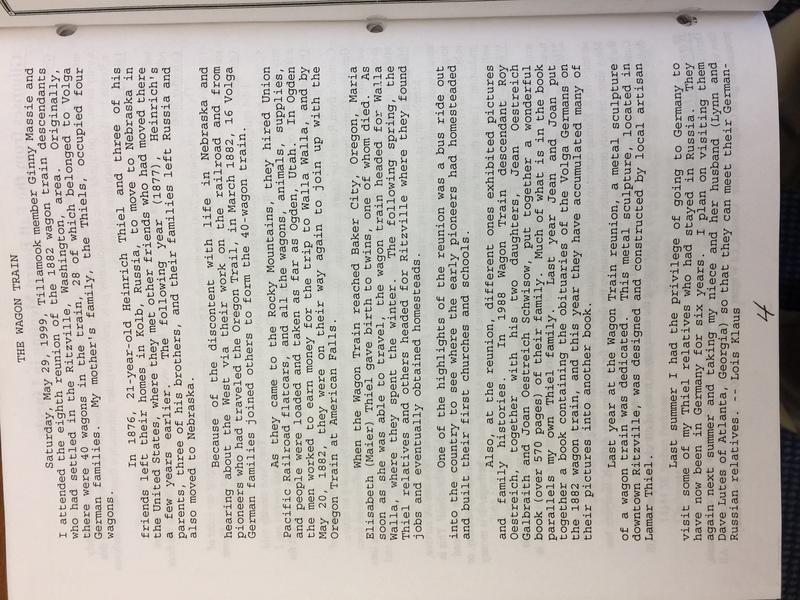 Emigration from Germany through Poland and Russia to the U.S.A. Salt Lake City, UT: Genealogical Society of the Church of Jesus Christ of Latter-day Saints, 1969. Print. Scheuerman, Richard D. "From Wagon Trails to Iron Rails: Russian German Immigration to the Pacific Northwest." Journal of the American Historical Society of Germans from Russia 2.2 (1979): 37. Print. "The O. R. and N. Co.'s Terminus. Work At Albina To Be Commerced Next Week". The Morning Oregonian [Portland], March 8, 1882.